Halomed North America is gratified to power the salt room in a business that is committed to the health and wellbeing of its customers. 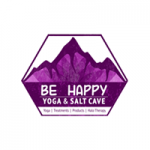 At Be Happy you'll find a world of different types of yoga classes and therapy, some done in the salt cave, which is the setting for daily events focused on mind and body health. Next month will usher in the salt cave's first string music concert. Be Happy is one of the many beautifully designed Himalayan salt caves that are the work of Margaret Smiechowski, owner of Salt Cave Inc.Halomed NA is proud to partner with Susan, Doug, and Margaret!